The Tambour doors we use are bespoke and can create a very contemporary look even in an ‘in frame’ kitchen as the photo here shows. They look great in a handleless or any modern style kitchen. 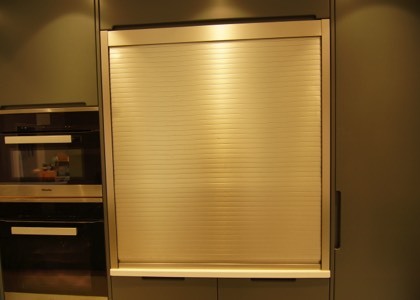 Tambour doors are perfect for creating small areas in which to put small appliances or store things like cereals, tea and coffee. You can have a section of worktop inside for easy cleaning and which looks fantastic - and the whole lot can be put out of sight in a jiffy by pulling the door down.